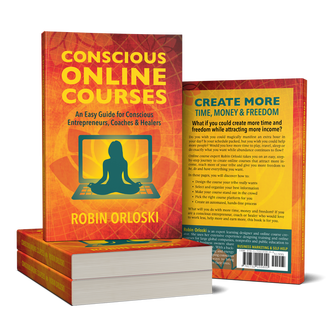 Robin Orloski shows conscious entrepreneurs, coaches and healers how to create more time, money and freedom by sharing their expertise online. She guides them on a step-by-step journey to design an online course their tribe will love and makes their hearts sing. You have something brilliant to share. You are a sought after yoga teacher with sold-out classes that blend yoga, chanting and environmental causes into a program that changes lives and supports the world around you. Right now you are changing your local community. You could transform more lives with a bigger footprint by taking your program online so people all over can create better lives for themselves as a result of your brilliant work. You are a Naturopath with an incredibly simple nutrition plan that can be easily customized by each person and has had amazing results. You'd like to help people all over get healthy by teaching them about nutrition and showing them how to customize the nutrition plan to fit their personal needs. ​with more people that need you. You are a business development wizard with a passion for helping conscious businesses grow quickly and successfully with a fail-proof system. You'd love to help more people, but you want to streamline your life, not add more hours to your day. It's time to create an online version of your system so people all over can access it whenever and wherever, while you are doing something else you love to do. These are just a few of the examples of how you can use the global reach of the Internet to expand your business while at the same time streamlining your calendar. If adding an online program, course or workshop to your growing business appeals to you, you are not alone. More people than ever are looking for ways to learn and grow with resources outside of their local communities. They are looking for exactly what you have to offer. Help them by making it easy for them to find you!